Inline stacking of the low profile De-Clumper™ model RDC-1515-SS atop the stationary inlet of the model 700-TH-50-SS mixer minimises headroom requirements while eliminating the need for flexible connections or hard piping between the units. 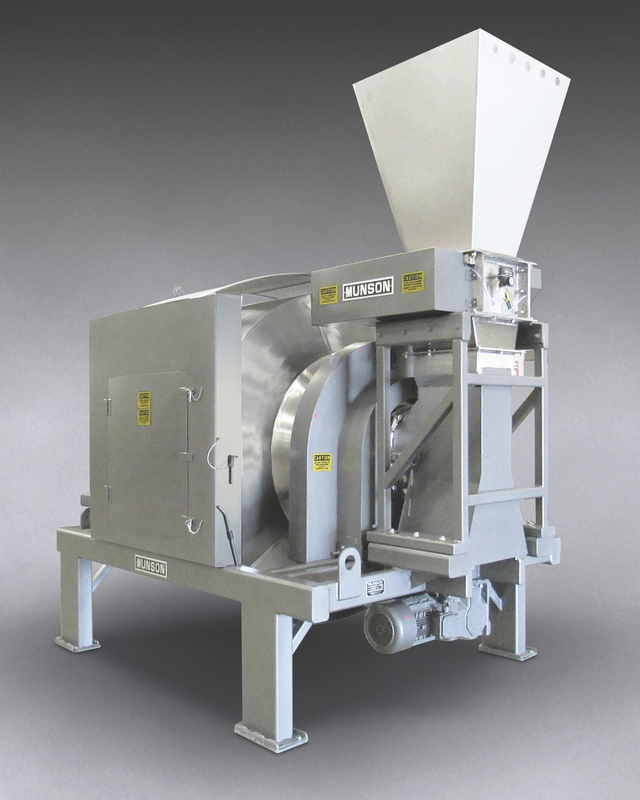 New Rotary Batch Mixer with integral Lump Breaker from Munson Machinery reduces agglomerated or compacted bulk chemical, food or pharmaceutical materials and blends batches of ingredients gently with total uniformity in one to three minutes. Material entering the system is de-lumped by dual rotors with three-point, single-piece, stainless steel breaking heads rotating with minimum clearance inside a curved, perforated bed screen. The synchronised shafts rotate at 120 rpm to prevent heating and degrading of the product. On-size material passes through bed screen apertures which range from 25 to 64 mm in diameter, immediately prior to entering the stationary inlet of the mixer. As the mixer’s horizontal drum rotates, proprietary mixing flights tumble, turn, cut and fold the material, imparting minimal energy to the batch, minimising or eliminating degradation. According to the company, total uniformity is achieved in less than three minutes regardless of disparities in the bulk densities, particle sizes or flow characteristics of batch ingredients. The internal flights lift and direct the entire batch into the stationary discharge spout for evacuation with no residual “heel” of material requiring manual removal, eliminating waste and improving product quality while facilitating rapid, thorough cleaning. The mixer has a useable batch capacity of 1.42 m3 and weight capacity of 1814 kg, and is said to be equally effective in blending of batches from 100 percent to as low as 5 percent of rated capacity. The company also offers Rotary Batch Mixers in capacities from 0.28 to 17 m3 and Lump Breakers with inlets from 305 to 1219 mm2, as well as Continuous Rotary Blenders, Variable Intensity Blenders, Vee Cone Blenders, and Ribbon-Paddle-Plow Blenders.